This years show featured a fine new layout on the Turntable: a 3 track L shaped layout featuring Mike’s yard, and Carl’s new crossover modules. 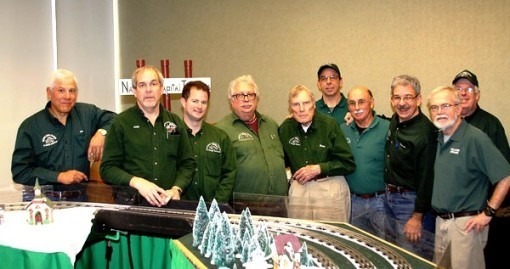 The layout was designed by Executive Assistant Trackmaster Ed Beaver. This year was also the first use of the Maryland Power Cabinet at the B&O. Setup was a snap, no problems, we started at 7AM and were running at 11:00 AM when the museum opened. We had lots of help from everyone with modules: Ed Beaver, Bill Hakkarinen, Harold Pavelka, Ralph Fox, Carl Condon, Tim Minor, Fred Koester, Dave Sealing, and some that just came to help: George Tsakiris, Frank and Giovanni Coneglio, Mika and Matt Milburn, Chuck Pestacchi, Tommy Johns, Doug List, and Barry Sheehe. The layout featured some really nice holiday decorated modules from Ralph Fox, Harold Pavelka (nice Bridge), and others. Show Days were split between myself, XO Ed Beaver and Deputy Trackmaster Carl Condon. Staffing was adequate to great, with plenty of run time for everyone due to the 3 tracks. The Legacy and DCS and Power Cabinet worked well. One big improvement was the range on the Legacy remote was greatly expanded from 30 feet last year to over 100 feet this year due to the new antennae on the Power Module. Crowds were good but not as heavy as in the early years. Operation was smooth all week. The combination of Mike’s yard and Carl’s crossovers gave us for the the first time the ability to stage trains in the yard, and then move them out to any of the three loops, which was fun and made crew changes faster. Many times we had two trains on each loop, running 6 trains at once was quite a sight. We had lots of runners drop in to run: Andrew Israel, Ben Saxe, Matt Flanagan, Fred Rossmark, Garrett and Ben Goldtein, Frank and Giovanni Coneglio, Tommy Johns, Steve Gobel, Doug List, and Phil Barbara among others. Free Cab rides on the Museum train were offered and many of us took advantage of it. The Museum had some very nice new decorations and looked great. Staff treated us well bringing us tables and chairs, and getting Trackers to the Cab rides when requested. Special thanks to Dave Sealing for transporting Crash 2 to and from the show. Take down went well, the museum closed at 4PM and we were on the road by 5:45PM. Many Thanks to all the participants and helpers, we could not have done it without you. I hope to see you all back at the B&O next year. 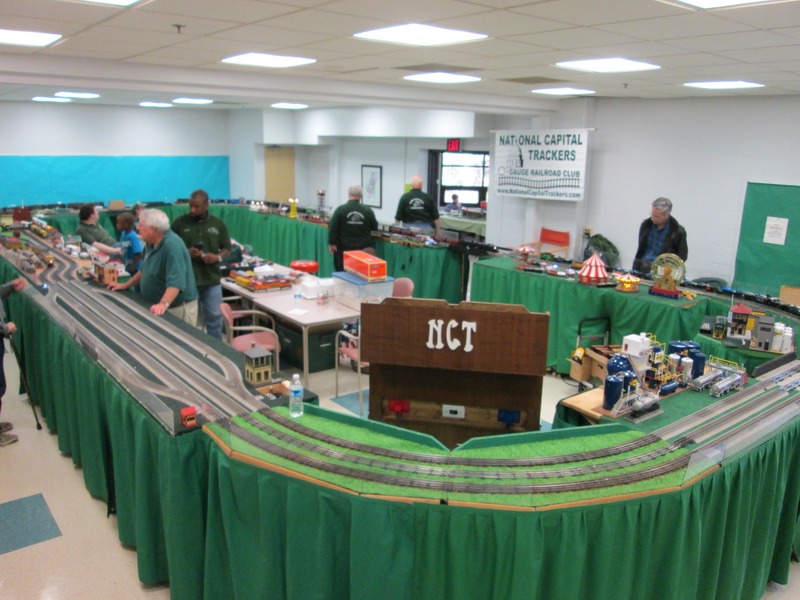 December 17, 2014 By Joe H.
November 30, 2014 By Joe H.
November 10, 2014 By Joe H.
November 8 & 9 brought the Trackers back to the Rockville Senior Center to participate in the 24th Annual Rockville Lions Club Benefit train show. This is a very fun, small show that hosts various clubs from around the metropolitan area to showcase their layouts and trains to the public. 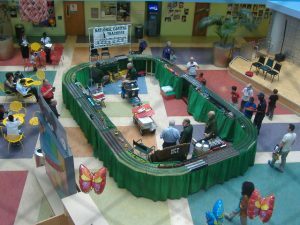 This is a very family oriented show – and lots of fun and is a watershed event for the Trackers, being the very first public display event the Trackers participated in and the show that got me to join the Trackers almost 10 years ago. In addition to the Trackers, railroads in Lego, Z, N, HO, G, and Standard gauges were all present, in addition to the Loco Doctor. It was particularly nice to see many new displays and modules by many of the clubs – the Z gauge club in particular, had a very nice airport and runway, ski slope, and wind turbines. In addition, being fascinated with intricate and somewhat unsual track designs (don’t ask me why…) I was particularly interested in the dual gauge trackage on the HO layout. N scale and HO rails on the same track. Cool stuff! Ed Beaver also lead the building of a Standard Gauge railroad in the adjacent sunroom. With Trackmaster George Tsakiris as our leader, we filled the room with a nice sized oval layout. I also offered to be the Assistant Trackmaster and George willingly accepted the idea (…..not sure what he was thinking….). Overall, I think the event went well and everyone had fun and plenty of run time. In past years, a large accordion style room divider wall and fish tank limited out room even further but with those removed, we were able to “spread out” a bit more. In addition, Mike Fistere Martin Dougherty and his son, Rick Eudy, new member Ron Tucker, Andrew Israel and his boys, Jack Frost and his grandson, Bob Easton, Dave Eadie, and new member Dave Malmquist all joined the fun. Special thanks to Dave Sealing and his wife for towing the trailer to the show and assisting with set up in addition to Jeff Talaga for taking the trailer home. If I missed anyone, my most sincere apologies. Operationally, the layout ran well. Two minor issue – a poor repair from a previous show to the ground on the Geezer Gate. Thanks to Jeff for properly fixing it. Second, on Sunday morning, the inner conventional loop totally stopped. We tried resetting the transformers, followed the published instructions included with the power cabinet, and more minor troubleshooting tactics. Jeff Talaga dug out his multimeter and found power going in to the TIU Variable channel but nothing coming out. My personal hunch is the internal fuse on the TIU channel blew but I’m not an expert and I’ll leave further investigation to the experts – I’m not touching the power cabinet! Of course, this doesn’t include some distracted engineers, particularly our Trackmaster who may have been talking instead of paying attention, and happily plowed into the back of the Assistant Trackmaster’s train. No damage, just some bruised pride and we were quickly back to runnin’ in circles all afternoon. This was the first Rockville show the power cabinet was used and was overall extremely beneficial in operation and set up thanks to everything being built in. Also on Sunday, Tracker Mike Fistere brought over his beautiful 1934 Packard Roadster. Chuck, Mike and myself took it to lunch Sunday. What a beautiful car. Thanks to Mike for letting us enjoy it with him. Word is if you tell him how nice of a car it is a certain number of times, he lets you borrow it for a weekend or two. See Mike for further details….. This being a show where many questions of “how to we get a train set”, “where to buy”, etc are asked by the public, I had the idea of setting up and “intro to O Gauge” poster. I tried to make it as informative and easy to read as I could but unfortunately couldn’t fit everything. I can see this expanding in the future. 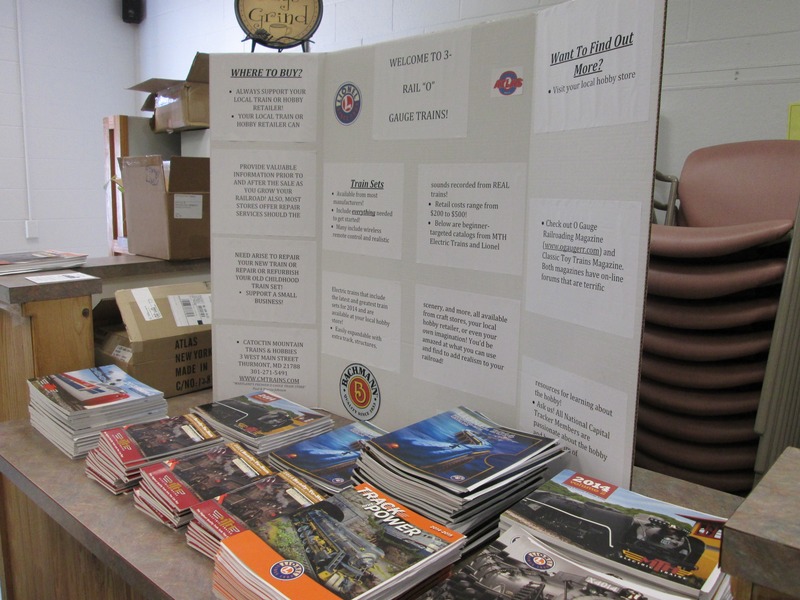 In addition, Paul Johnson of Catoctin Mountain Trains generously donated to me boxes of MTH and Lionel Train Set and Signature Catalogs as well as business cards attached to each catalog. I’m happy to report many excited kids, young and old, took catalogs home and hopefully the display inspired them to get into the hobby or dust off their old trains from years past. See below for photos of the display on Saturday morning. By Sunday, about 7 boxes of catalogs were gone. Only a handful came back home with me. Thanks to all that participated. As always, it was a LOT of fun and I look forward to next year! September 15, 2014 By Joe H.
This was the first time we have had a show at Children’s Hospital. The Show was a one day show with setup from 0800 to 1000 and shutdown at 1600. The reaction from the audience and the club members was unanimous that it was a successful show. We are planning on a return to this venue in March or April 2015 with a two day event. All nine participants had plenty of run time. In addition to the eight club members listed below, Eli Berkowitz (13 years old) was invited to participate as a guest engineer running the Thomas trains. He also provided the scenery on one of the corners. Eli has been a patient or Children’s on a number of occasions. His mother Michelle was instrumental in us holding the show there. 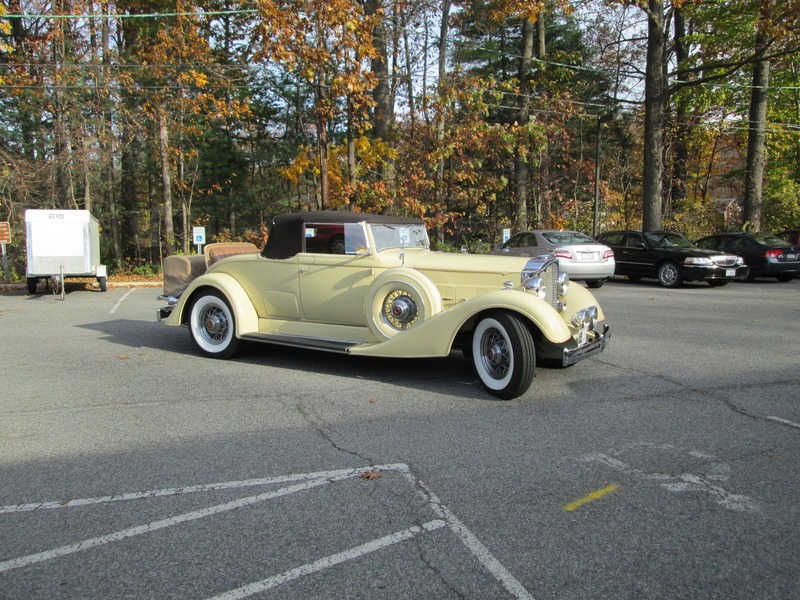 The arrival went smoothly although the drive in for many of the members was a bit long. Checking in with the Security force was simple and required just showing a drivers license. The loading dock was on the first floor, the same as the show space, so it was a simple trip thru some wide corridors to the space. We had the layout complete and the first train running at 1000. It was actually 1030 when we had completed the scenery. We used a simple rectangle with wide radius corners, the Geezer Gate and the two 2 foot bridges. Attached is the layout drawing. Since this was a new venue and we weren’t sure how difficult it would be to get there or to set up, we used a minimalist approach on the scenery (i.e. simple stuff easily setup and taken down with only a buildings. There was a coffee bar within 15 feet of us and a very nice cafeteria on the second floor for snacks and lunch. The member vehicles, other that the tow vehicle and club trailer, were all parked in the attached parking garage. The parking was paid for by the hospital. The tow vehicle and trailer were left near the loading dock for the day. One final note, one of the audience approached Regis about doing a show at another healthcare facility in the District. She left her contact information so we will investigate that further. June 29, 2014 By Joe H.